Today is my 29th birthday. Although Mom and I are going to Salem next week to celebrate, we decided to stop for lunch at the Old Country Buffet in Seekonk, MA, on the way to pick up my birthday cake at the neighboring Cold Stone Creamery. 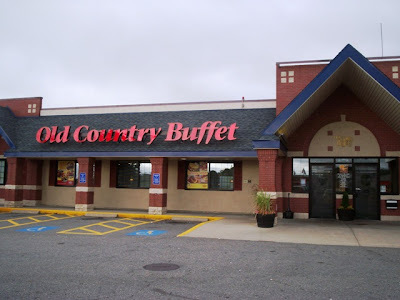 I always hear mixed things about Old Country Buffet. A friend of mine recently told me that I'm the only person he knows that eats at OCB and doesn't get sick. I've always found the food good, but some people have reserves about buffets, and thus are turned off to this type of franchise. We pulled into the parking lot at around 4:30 p.m. There weren't a lot of cars in the parking lot and that is probably because it was too early for the dinner rush. When we got inside, we were greeted by a cashier who rang us up. The cost was $10.89 per person (the dinner price), and Mom paid $22.87 total (with $1.09 tax). Attached to our receipt was a long yellow paper that had the number two written into a box at the bottom of the slip. This slip allows us to "claim" a table while we go up and check out the buffet. We chose a booth close to the door and close to the steam tables, put our yellow slip on the table, and proceeded to go and check out the food. Old Country Buffet serves everyday favorites at both lunch and dinner, such as assorted burgers, tacos, macaroni and cheese, hand-breaded baked and fried chicken, baked fish and fried fish, mashed potatoes and gravy, and assorted vegetables, side dishes, and a potato bar. There is also an extensive "build-your-own" salad bar including a variety of freshly prepared salads. There is a separate dessert bar featuring an ice cream machine that serves chocolate, vanilla, and swirl soft serve. Both hot and cold beverages are available, and all utensils and dinnerware (plates, knives, forks, cups, etc.) are kept at the end of each table. Daily specials are available for both lunch and dinner. Today's dinner specials were carved ham, meatloaf, carved turkey, orange chicken, and fried shrimp. 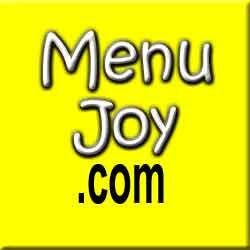 All food is cooked all day long, and 90 home style choices are cooked every day. The daily features change throughout the week, and vary between the franchises. New items are featured during the special menu promotions, and seasonal favorites are also available at given times. Both beverages and desserts are always included in the price. There is also a breakfast buffet on Saturdays and Sundays featuring carved ham, bacon, eggs Benedict, fresh fruit, biscuits and country gravy, waffles, corned beef hash, French toast, sausage, scrambled eggs, buttermilk pancakes, country fried steak, pastries, donuts, and quiche. At this particular location, there is a banquet room available for parties and assorted gatherings at no additional charge. Make sure to call ahead to get a reservation. Both Mom and I made two trips to the steam tables. 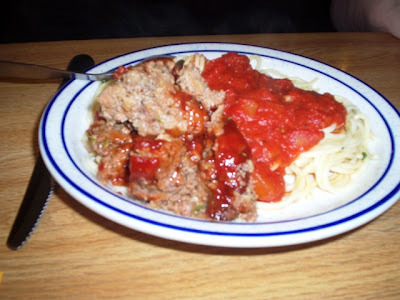 On Mom's visits, she chose the fried chicken, mashed potatoes, orange chicken, a cinnamon bun, meatloaf, and spaghetti with marinara sauce. On my visits, I chose the baked fish, sauteed mushrooms in garlic sauce, fried catfish, bread stuffing, a taco salad in a tortilla bowl, macaroni and cheese, and mashed potatoes with gravy. 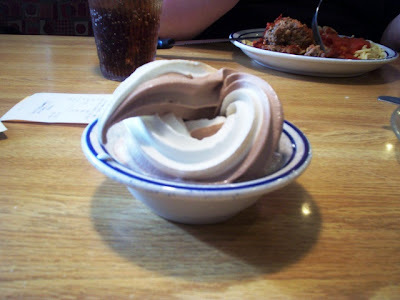 Both Mom and I had chocolate/vanilla swirl ice cream for dessert. Because I forgot to take a picture of my adorable taco bowl, I made sure to capture Mom's meatloaf and spaghetti, and my soft serve ice cream. I know ... it's not as cute. 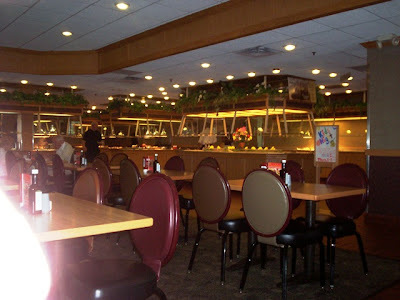 We've been to two Old Country Buffet locations - Seekonk and Dartmouth, MA - and both dining rooms are quite large. 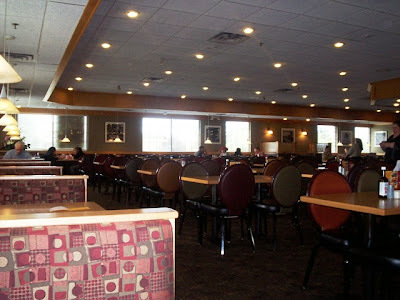 Made to hold a large amount of patrons, the Seekonk dining room is neatly set up with booths along the edge of the room, and tables lined up on both sides of the buffet. With the spotlight mainly over the steam tables, the low lights and dark fabrics allow the food to stand out and be the center of everyone's attention. Both Mom and I felt that the food, for the most part, was up to par. However, some things tasted like they had been left out a little too long. My macaroni and cheese was a bit on the clumpy side, and my baked fish was tough. Mom's orange chicken was a little cold, and her cinnamon roll was cold and dried out. At the opposite end of the spectrum, Mom's fried chicken was hot and juicy, while my taco salad was fresh and tasty. Also, the mashed potatoes were quite delicious. All in all, we had a good meal at the Old Country Buffet. Although we did notice the price increase, you can certainly get a lot for your money. Bring your appetite because there is plenty to choose from. 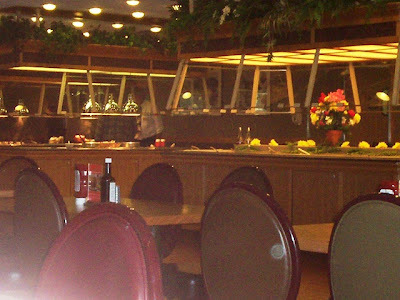 Old Country Buffet is a food lover's dream, and all the tasty choices keep us coming back for more. The general restaurant hours of operation for Old Country Buffet are: Monday through Thursday from 11 a.m. to 8:30 p.m., Friday from 11 a.m. to 9 p.m., Saturday from 8 a.m. to 9 p.m., and Sundays from 8 a.m. to 8:30 p.m.